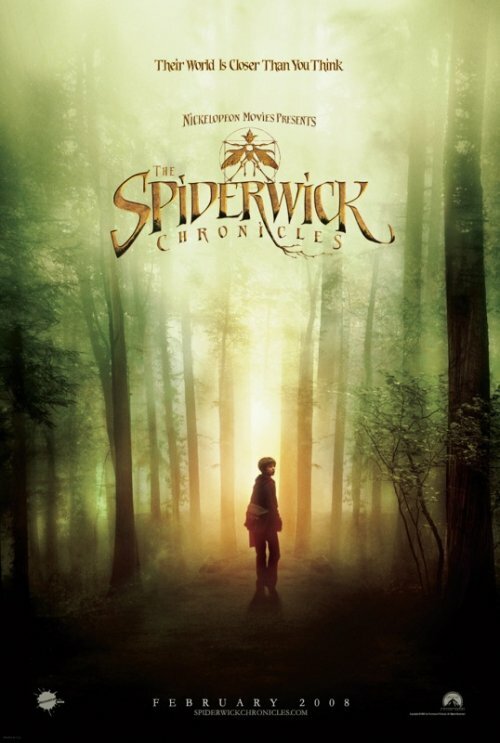 I was very impressed by the trailer for The Spiderwick Chronicles. It made the movie seem a lot more interesting and a little darker than I expected. In fact, it made me think that there is a chance I might actually enjoy the movie. This poster, on the other hand, reminds me of why I used to be completely uninterested in the film. Which is not at all to say that it’s a bad poster. It’s a nice teaser poster. The blurry and weirdly colored forest, together with the tagline, make it pretty clear that this movie involves some sort of parallel and probably magical universe. And the kid at the center, cautiously entering the forest, seems to indicate that this will be a “child stumbles upon a fantasy world” film, in the style of Narnia, which is sure to get some people interested. And the overall look is unique enough to be memorable. Hopefully the final poster will reveal many other fantastic elements not shown currently, but you can’t show everything in the teaser. But the poster, with it’s bright colors, forest setting and highlighted child star, does make the movie seem very light and kid friendly. Which is why I assumed I wouldn’t be interested in it. The poster seems to set the movie as something that is of interest strictly for children and young teens. Nothing wrong with that. The big fantasy movies (Narnia, LotR, Potter) derived much of their success from the ability to appeal to older teens and adults, but that doesn’t mean that Spiderwick has to go for similarly broad appeal. I do wonder whether people, including kids, might be getting tired of all the fantasy movies staring children. We have had many of them, there is a bunch of others that will open this year and yet another bunch that is being announced. With all those similar films hitting the theaters, standing out might get a lot harder, which means that the marketing material (including posters) is going to have to become more creative. I think that it looks very interesting and hey, if so many people love fantasy movies, why shouldn’t they produce more of them? It’s all the better for us, the audience. I think that the author of the text is very narrow minded.